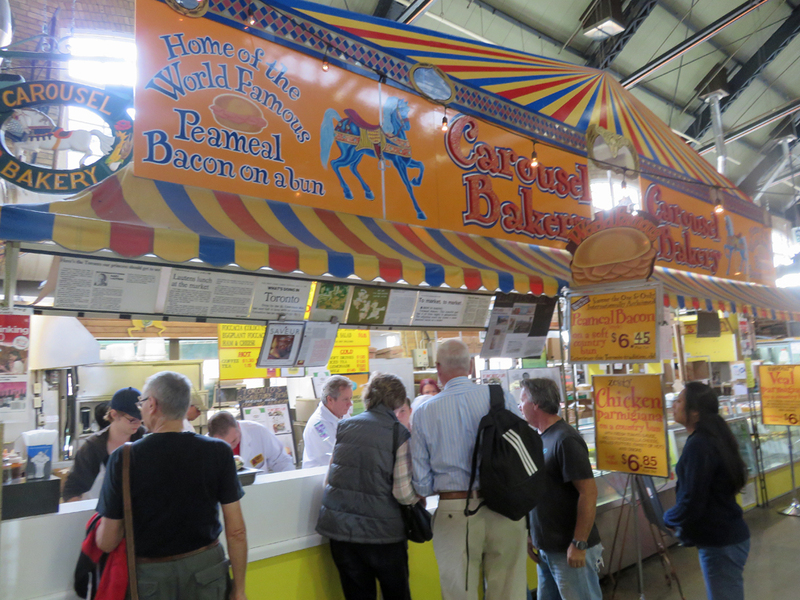 St. Lawrence Market is Where You Can Get a Peameal Sandwich and Big Jug of Maple Syrup – Why Am I Not There? In your must-do in any major city is visit the city’s food court. Even though the tourist to local ratio leans towards the tourist side, you get a sense of local cuisine and maybe find some decent food stuffs to take home with you. 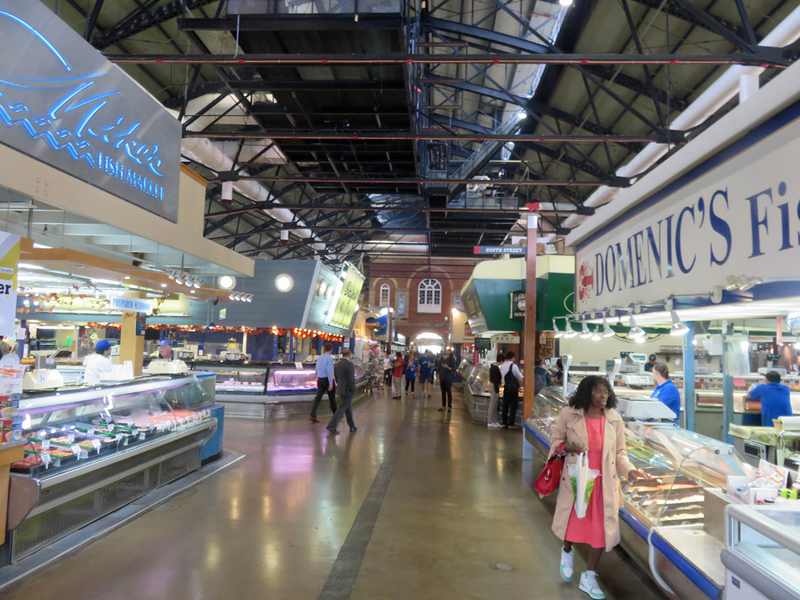 Locals are proud of the St. Lawrence Market. It’s consistently mentioned on Best Of lists for best markets in the world. Should it be? Sure, why not, but it should be opened up on Monday. People like to each lunch on Mondays, too. Every cuisine is represented so for locals they can try each stall through the years. The astute traveler can spot that the longest line probably has the best food. In this case, if you head to the back you’ll find Buster’s Sea Cove. It’s the permanent location of the popular food truck that serves freshly fried fish n’ chips, crabcakes and muscles. I love a good fish n’ chips, but for a 20 person deep line, I’ll pass. I’ve mentioned in this space that Canadians don’t really have a native cuisine beyond poutine, which is more French-Canadian. What you can eat at the market that is a Canadian specialty is the peameal sandwich. It’s not an overly ambitious sandwich where it takes special, hard-t0-find ingredients to make. It’s basically Canadian back bacon (wet cured bacon rolled in cornmeal) on a kaiser roll. You cam also add into some pickles and hot peppers for some added flavor. From Wikipedia: The name “peameal bacon” derives from the historic practice of rolling the cured and trimmed boneless loin in dried and ground yellow peas to extend shelf life. Since the end of World War II it has been rolled in ground yellow cornmeal. There’s two places in the market to try them, and for the ambitious eater you can have a sandwich from both counters. The most popular is Carousel Bakery. It’s the counter with the faded photos of celebrities and laminated newspaper articles. Heck, if it’s good enough for Catherine Zeta-Jones and Chow Yun-Fat, it’s good enough for me. Here, they keep the sandwich in it’s purest form, just bacon on a roll. No fillings or toppings are offered. 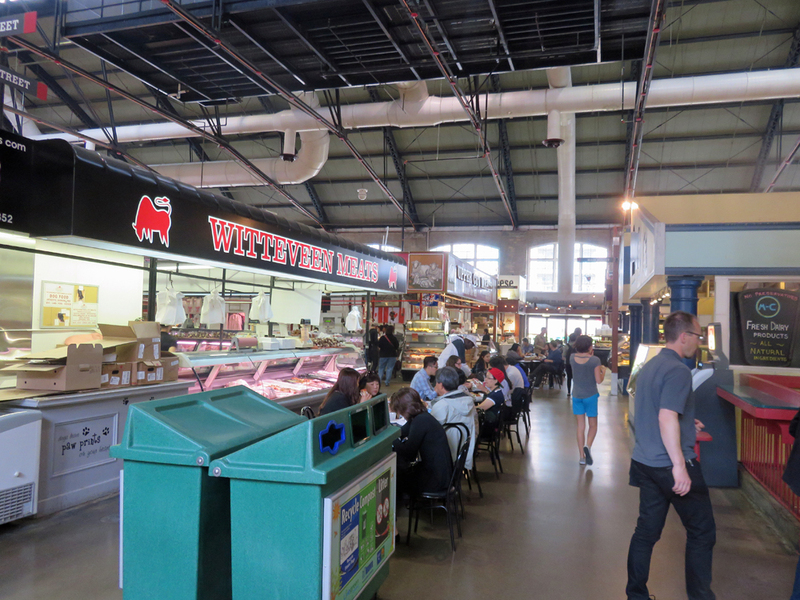 Within eyeshot is Paddington’s Pump where they can add in more flavor to your peameal. Because of the added pickles, lettuce and such, I preferred this counter. 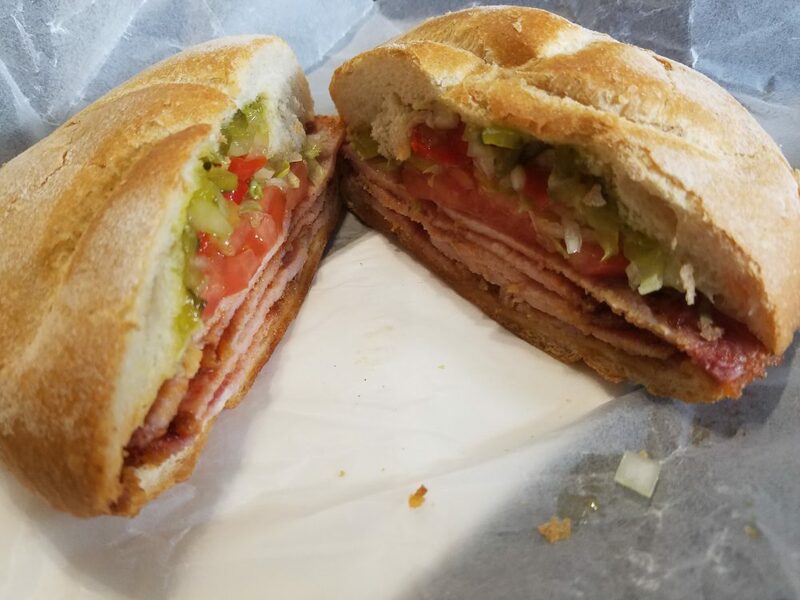 Either will satisfy your peameal quota and at a reasonable $6, it won’t break the bank. Head downstairs where you’ll see more food options, but more must-browse shopping. There’s a storefront for the gourmet mustard brand Kozliks. You can get it America or online, but the stall at the market offers much more variety of mustard, sauces and spread. I ended up buying six different jars of maple, hot and grain mustard along with some whisky mustard barbecue sauce. Come on, they make great gifts! Finally, I needed to get some maple syrup. You have to get the syrup, it’s on their flag! 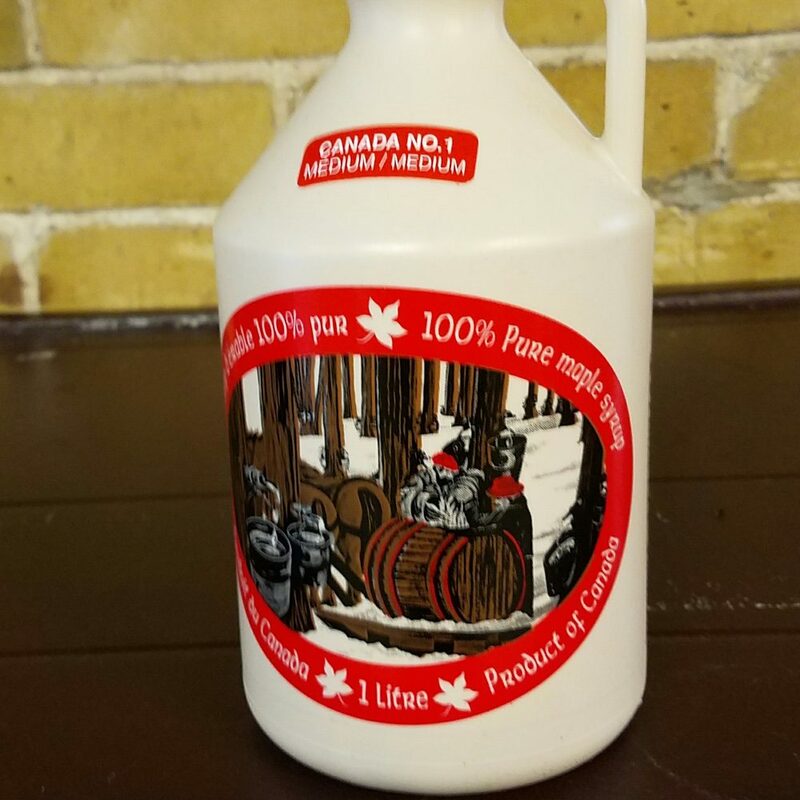 There’s a can’t-miss sugar shack downstairs where you can get maple syrup in many forms. If the peameal sandwiches haven’t made you loosen your belt too much, you can have some maple syrup ice cream. The sugar shack sells all sizes and grades of syrup including B for those looking to do the master cleanse. I took home a liter of that liquid gold, so I’m thinking I’m good with sizzurp for the rest of my life.